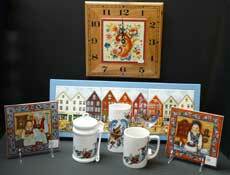 Viking Treasures carries an assortment of products imported from Norway. Stop in today to find the perfect Norwegian gift. 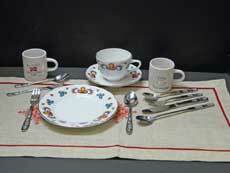 Our Norwegian products feature a wide variety of items including: Fjord Design Scandinavian Flatware, featuring the Kristin, Nora and Ramona patterns; Kongetinn-Royal Pewter Flatware inspired by King Olav the Holy; HardangerBestikk serving pieces and Barnebestikk (flatware for children) all from Fjord Design. Trolls are older than humankind. They’re giants living in the mountains, forests and rivers of Norway. You wouldn't want to meet up with a real troll, but if you’re looking for trolls that are ‘so ugly they’re cute’, to take home with you, just stop on by to see our collection. We have Fosse, NyForm, Lommedalen and Tusse trolls. And we have a great collection of books about trolls. Nisser (house elves), on the other hand, are gentle folk that live nearby in your barn or attic. They are friends to all animals and were environmentalists before the word was invented. They can be very mischievous especially if you forget about them or do not believe in them. Remember to set out a dish of rømmegrøt (sour cream porridge) or risengrynsgrøt (rice porridge) for them at Christmas and treat your pets kindly and you shouldn't have any trouble with the nisser at your house. 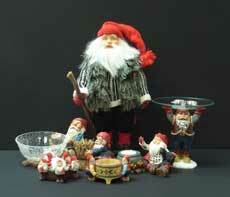 If you would like a nisse figurine to set about your home, we have an assortment to choose from. Our Norwegian jewelry comes in a wide range of styles, from reproductions of Viking jewelry including amulets of Thor’s hammer (Mjølnir), to the traditional sterling silver sølje, to modern glass. We also carry Norwegian enameled heart pendants that have the Lord’s Prayer engraved on the back. If you’re baking Norwegian cookies for Christmas or special events, you’re going to need a krumkake iron, rosette iron, sandkake tins, vafler iron and maybe a new Norwegian cookbook or two. And speaking of food, we have: Freia milk chocolate, SOLO orange beverage, Toro mix for rømmegrøt (sour cream porridge) and Ole and Lena fortune cookies. Just some of our delicious Scandinavian choices that also includes gløgg mixes, licorice, lingonberry (tyttebœr) and cloudberry (molte) preserves, and more. Uff Da!! We have Uff Da mugs, napkins, shot glasses, towels, dish cloths, window graphics, Uff Da Pocket Farkel, deck of cards, tin of mints and more. There are more Norwegian items to choose from than can be listed, from calendars, Christmas cards, prints and framed works from renowned Norwegian artists to mugs, flags, windsocks, decals, key chains, lapel pins… Uff da!! Shop for Norwegian imports at Viking Treasures to help celebrate Norwegian festivals and learn more about Norwegian history. 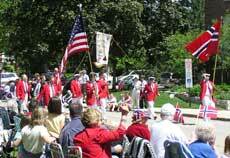 It is Norway’s National Day of Celebration such as July 4th is to the U.S.A. This is the day the Norwegians gained their constitutional independence from Sweden in 1814. Chicagoland Norwegians celebrate with a parade every year on the Sunday closest to the 17th of May that is not Mother's Day. Go back to the main product page or to any of the category pages, below.